Captain Edgerly, Winfield S.: Commanding Troop. First Lieutenant Brewer, Edwin P.: With Troop. Second Lieutenant Bell, James F.: Absent with leave since Nov. 21st, 1890 per Special Order #267 Adjutant General’s Office 1890. ¥ First Sergeant Toy, Frederick E.: Enlisted on October 16, 1888 at Fort Riley, Kansas, by Lt. McCormick. Adjutant General’s Office–granted a Medal of Honor. Sergeant Sharp, William: Enlisted on February 2, 1887 at Philadelphia, Pennsylvania, by Lt. Scott. Sergeant Casey, Francis B.: Enlisted on December 18, 1886 at New York, New York, by Capt. Jackson. Sergeant Rennick, William: Enlisted on November 4, 1887 at Philadelphia, Pennsylvania, by Lt. Scott. On furlough for (3) three months from Nov. 4th, ‘90 to Feb. 3rd, ‘91 under provisions of paragraph 3 General Order #80 signed ‘90, Adjutant General’s Office. Due soldier pay from June 1 to June 30th, ‘90. Sergeant Rathgeber, George H.: Enlisted on January 25, 1887 at Jersey City, New Jersey, by Capt. Vroom. Joined by transfer from Troop “L” 7th Cav., per Order No. 86 Headquarters, 7th Cav., Camp at Pine Ridge Agency, S. D., December 1, 1890. Corporal Kopp, Adolph: Enlisted on September 6, 1888 at Cincinnati, Ohio, by Lt. Hunter. Corporal Steckel, William L.: Enlisted on September 4, 1888 at Cleveland, Ohio, by Capt. Kellogg. Corporal Baker, Frederick: Enlisted on April 28, 1887 at New York, New York, by Lt. Wheeler. Corporal Devereaux, Eugene B.: Enlisted on October 12, 1888 at Detroit, Michigan, by Capt. Loud. Trumpeter Shelman, Henry: Enlisted on March 30, 1886 at Fort Snelling, Minnesota, by Lt. Wilson. Trumpeter Timmerman, William: Enlisted on November 14, 1887 at Milwaukee, Wisconsin, by Capt. Drum. Farrier O’Connor, James W.: Enlisted on December 22, 1886 at Detroit, Michigan, by Capt. Loud. Blacksmith Huston, Edward: Enlisted on July 6, 1888 at Washington, District of Columbia, by Capt. Scott. Saddler Morten, Edward: Enlisted on July 7, 1887 at Fort Leavenworth, Kansas, by Lt. Paddock. Wagoner Fadler, Adam: Enlisted on September 4, 1889 at New York, New York, by Lt. Carter. Private Allen, Clarence H.: Enlisted on April 8, 1889 at Cincinnati, Ohio, by Capt. Ropes. Private Beyer, August: Enlisted on September 11, 1887 at Springfield, Massachusetts, by Capt. Ropes. Private Blauser, Peter H.: Enlisted on August 30, 1890 at Pittsburgh, Pennsylvania, by Capt. Tisdell. Joined Troop at Pine Ridge Agency, S. D., Dec. 6th, 1890. Assigned to troop per Order #88 Headquarters 7th Cav. In the field to date from Nov. 28th, ‘90. Due U.S. Laundry forty one (41) cents. Retained $4.00 per month until 29 Aug., ‘91. Private Bogle, Thomas T.: Enlisted on August 15, 1888 at Springfield, Massachusetts, by Capt. Ropes. On detached service with Band 7th Cav., at Ft Riley, Ks. per Order No. 62, Headquarters 7th Cav., Ft Riley, Ks., August 19th, 1890. Private Bower, George: Enlisted on August 22, 1890 at Fort Riley, Kansas, by Lt. McCormick. Retained $4.00 per month until 21 Aug., ‘91. Private Burns, Owen: Enlisted on April 11, 1890 at Providence, Rhode Island, by Capt. Thompson. Private Campbell, William: Enlisted on August 25, 1888 at Springfield, Massachusetts, by Capt. Ropes. Private Carlson, Charles: Enlisted on October 11, 1888 at Denver, Colorado, by Lt. Borden. 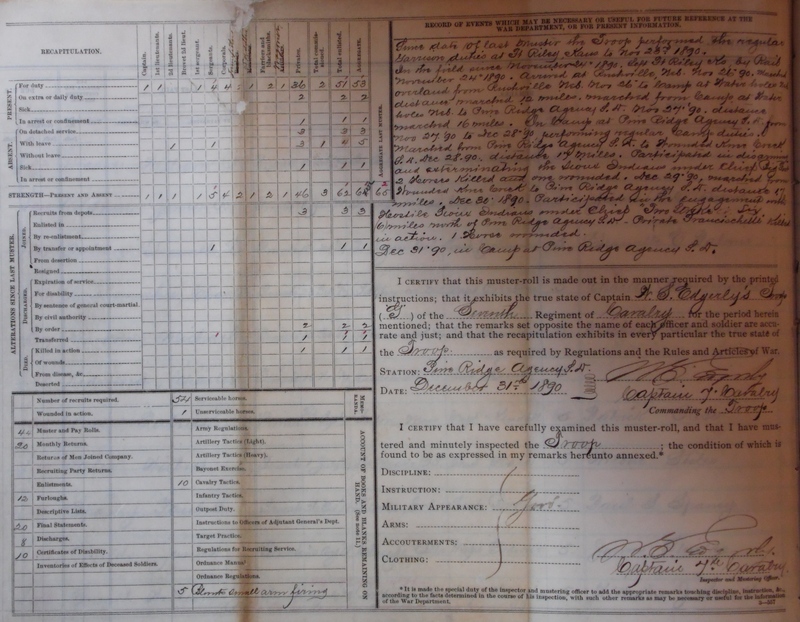 Absent sick in Post Hospital at Fort Riley, Kansas, since Nov. 24th, 1890, disease unknown. Private Carr, Denis: Enlisted on March 29, 1890 at Philadelphia, Pennsylvania, by Capt. Dodd. Sentenced to forfeit to the U.S. one (1) dollar of his pay per Field Order #11, Pine Ridge Agency, S. D., Dec. 18th, 1890. Private Cloud, John W.: Enlisted on January 4, 1890 at Columbus Barracks, Ohio, by Lt. Williams. Private Croslon, William: Enlisted on November 9, 1887 at Boston, Massachusetts, by Capt. Miller. On furlough since Nov. 11th, ‘90 under provisions of paragraph 3, General Order 80, signed ‘90, Adjutant General’s Office. Private Chamberlain, Guy: Enlisted on July 22, 1887 at New York, New York, by Capt. Jackson. Private Dougherty, Edward: Enlisted on April 15, 1890 at Cincinnati, Ohio, by Capt. Haines. Private DuBois, Lynes R.: Enlisted on June 5, 1890 at New York, New York, by Capt. Wagner. Private Edwards, Edward: Enlisted on May 1, 1889 at Philadelphia, Pennsylvania, by Lt. Dodd. Private Fitzenreuter, Henry A.: Enlisted on March 20, 1889 at Detroit, Michigan, by Capt. Kennedy. Private Hadden, John: Enlisted on December 21, 1888 at Cleveland, Ohio, by Capt. Kellogg. ¥ Private Hamilton, Matthew H.: Enlisted on July 6, 1888 at New York, New York, by Lt. Wheeler. Adjutant General’s Office–granted a Medal of Honor. Private Henderson, John J.: Enlisted on August 22, 1890 at Fort Riley, Kansas, by Lt. McCormick. Private Jones, Herman B.: Enlisted on August 22, 1890 at Fort Riley, Kansas, by Lt. McCormick. Private Jones, Henry: Enlisted on April 4, 1887 at New York, New York, by Capt. Jackson. Private Kaiser, Frederick: Enlisted on February 6, 1889 at Fort Riley, Kansas, by Lt. McCormick. On extra duty as Clerk in the Subsistence Department, Headquarters Department of the Platte in the Field per Field Order #9, Camp at Pine Ridge Agency, S. D., Dec. 14th, 1890. Private Kelley, John: Enlisted on August 2, 1888 at New York, New York, by Capt. Jackson. On Special duty as Troop Cook since Nov. 24th, 1890. Private Kenney, Nicholas: Enlisted on December 31, 1887 at Philadelphia, Pennsylvania, by Lt. Scott. Private Kirwan, Michael: Enlisted on November 15, 1888 at Newark, New Jersey, by Lt. Carter. Private Kuhns, Daniel M.: Enlisted on January 8, 1886 at Jefferson Barracks, Missouri, by Lt. Mann. Sentenced to forfeit to the U.S. three (3) dollars of his pay per field orders No. 10, Camp at Pine Ridge Agency, S.D., Dec.15th, 1890. Private Liddy, Patrick: Enlisted on January 29, 1887 at New York, New York, by Capt. Jackson. Private Mahoney, George: Enlisted on October 13, 1888 at Fort Riley, Kansas, by Lt. McCormick. In confinement since Dec. 3rd, 1890 awaiting trial by General Court Martial. Private Mayer, John H.: Enlisted on August 6, 1888 at New York, New York, by Lt. Wheeler. On Detached Service at Ft. Riley, Ks., since Dec. 24, 1890 per verbal order Regimental Commander. Private Marsters, James F.: Enlisted on February 12, 1887 at Jefferson Barracks, Missouri, by Lt. Fountain. Private Moore, William B.: Enlisted on March 11, 1889 at Fort Riley, Kansas, by Lt. McCormick. On detached service at Ft. Riley, Ks., per verbal order Regimental Commander, Dec. 24, 1890. Private O’Brien, James R.: Enlisted on January 6, 1888 at Springfield, Massachusetts, by Capt. Ropes. Private Palmer, Granville E.: Enlisted on December 13, 1889 at Fort Logan, Colorado, by Lt. Johnson. Private Radenmacher, Charles: Enlisted on February 23, 1887 at Baltimore, Maryland, by Capt. Overton. Private Reardon, Michael: Enlisted on February 15, 1888 at Jefferson Barracks, Missouri., by Lt. Fountain. Private Ridenour, Charles: Enlisted on November 10, 1887 at Cincinnati, Ohio, by Lt. Hunter. On furlough since Nov. 11th, ‘90 under provisions of paragraph 3, General Order 80, signed ‘90, Adjutant General’s Office. Private Ross, Patrick: Enlisted on September 23, 1890 at Boston, Massachusetts, by Capt. Kendall. Joined Troop at Pine Ridge Agency, S. D., Dec. 6th, 1890. Assigned to troop per Order #88 Headquarters 7th Cav., in the field to date Nov. 28th, ‘90. Due U.S. Laundry fifty one (51) cents. Retained $4.00 per month until 21 Sep., ‘91. Private Stiles, Wilbur: Enlisted on July 1, 1887 at Fort Meade, Dakota Territory, by Lt. Hare. Private Spaney, Paul L.: Enlisted on October 26, 1888 at Denver, Colorado, by Lt. Borden. Private Shields, James: Enlisted on August 20, 1888 at Chicago, Illinois, by Capt. Godwin. Private Small, William J.: Enlisted on July 9, 1889 at Baltimore, Maryland, by Capt. Huggins. § Private Francischetti, Dominick: Enlisted on September 9, 1889 at Chicago, Illinois, by Capt. Nowlan. Killed in action Dec. 30, 1890, 6 miles north of Pine Ridge Agency, S.D. (Click to enlarge) The Recapitulation and Record of Events Page of G Troop, 7th Cavalry Regiment’s Muster Roll of December, 1891. Since date of last muster the Troop performed the regular Garrison duties at Ft. Riley, Kans. to Nov. 23rd, 1890. In the field since November 24th, 1890. Left Ft. Riley, Ks., by Rail November 24th, 1890. Arrived at Rushville, Neb., Nov 26th, ‘90. Marched overland from Rushville, Neb., Nov. 26th to Camp at Water holes, Neb., distance marched 12 miles. Marched from Camp at Water holes, Neb., to Pine Ridge Agency, S.D., Nov. 27th, ‘90, distance marched 16 miles. In Camp at Pine Ridge Agency, S. D., from Nov. 27th, ‘90 to Dec. 28th, ‘90, performing regular camp duties. Marched from Pine Ridge Agency, S. D., to Wounded Knee Creek, S. D., Dec. 28th, ‘90, distance 17 miles. Participated in disarming and exterminating the Sioux Indians under Chief Big Foot. 2 horses killed and one wounded. Dec. 29th, ‘90, marched from Wounded Knee Creek to Pine Ridge Agency, S.D., distance 17 miles. Dec. 30th, 1890, participated in the engagement with Hostile Sioux Indians under Chief “Two Strike” six miles north of Pine Ridge Agency, S.D. Private Francischetti killed in action. 1 Horse wounded. Dec. 31, ‘90, in Camp at Pine Ridge Agency, S. D.
Source: Adjutant General’s Officer, “7th Cavalry, Troop G, Jan. 1885 – Dec. 1897,” Muster Rolls of Regular Army Organizations, 1784 – Oct. 31, 1912, Record Group 94, (Washington: National Archives Record Administration). The original G Troop Muster Roll at the National Archives was disassembled at some point and put back together in incorrect order, and at least one page is missing. The page annotating the names of the last three privates assigned and the transfers, discharges, and casualties according to the numbers reported in the Recapitulation section are missing as is at least one page of remarks. The information regarding Private Franceschetti was obtained from his military enlistment record, and the incorrect spelling of his last name is based on how Captain Edgerly spelled Franceschetti’s name in the Record of Events section. 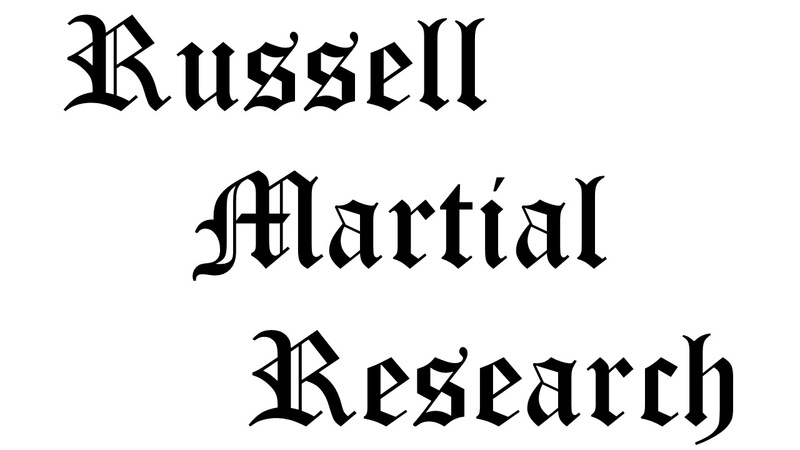 Citation for this article: Samuel L. Russell, “G Troop, 7th Cavalry Regiment Muster Roll,” Army at Wounded Knee (Carlisle, PA: Russell Martial Research, 2015-2016, http://wp.me/p3NoJy-xu), posted 15 Aug 2015, accessed _______. This entry was posted in Muster Rolls and tagged 1890, 7th Cavalry, 7th Cavalry Regiment (United States), Battle of Wounded Knee, Cavalry, Cavalry Troop, Sioux, Wounded Knee, Wounded Knee Creek, Wounded Knee Massacre. Bookmark the permalink.